I love nature and trees in particular. 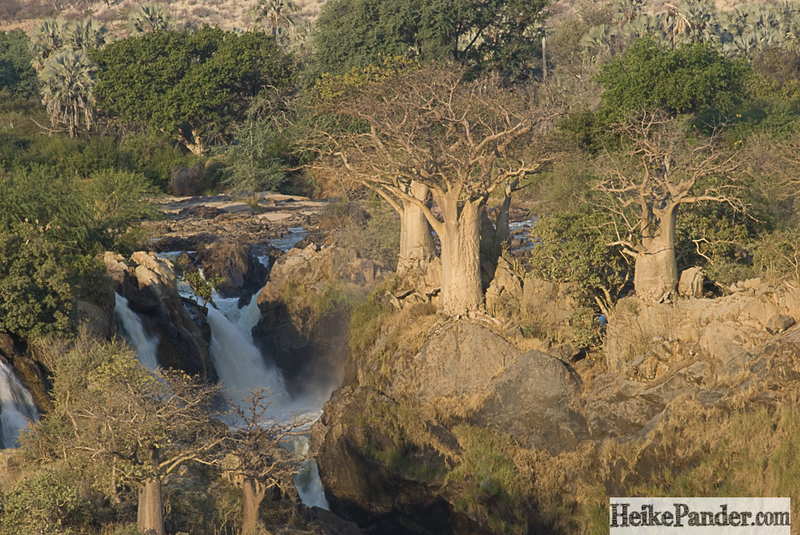 As a child I admired tree climbers climbing giants in jungles dangling from their ropes – trying to reach the crowns. I would not have dared to try it. Trees are quite familiar to me from a worm’s-eye view. On a hot summer day I enjoy to lie in a meadow under a big tree – with a soothing view into the tree’s canopy. The sun plays its game of light and shadow on my face. The scent of summer in my nose. Superb. High under the clouds from an airplane I marvel at the dense foliage of the green lung from above. But usually the trees are too far away for me to really make out the details. 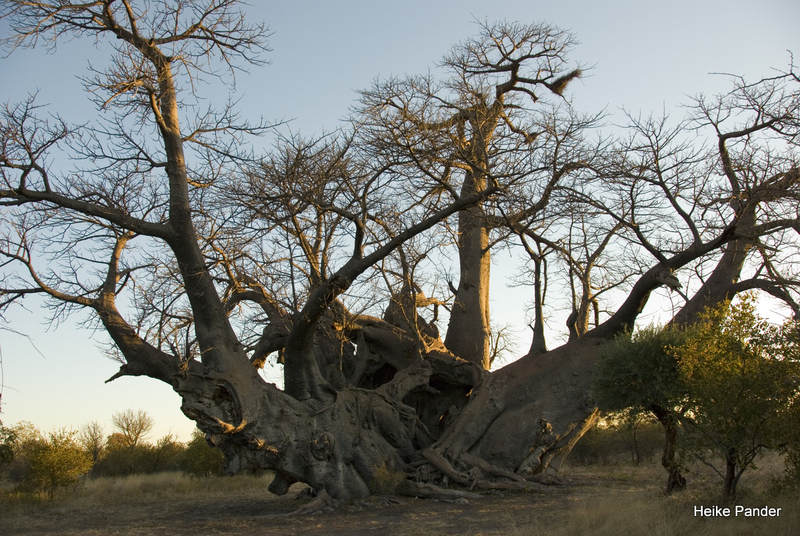 As a child I was interested in the secrets that were hidden at the bottom of trees in their mighty root systems. But I wanted to know what was happening in the treetops even more because at that time they seemed so far out of my reach. A help to satisfy my curiosity arose a few years ago in the form of treetop trails. The concept of most of them is very similar: one can easily access the paths via ramps, stairs or sometimes even by elevator. 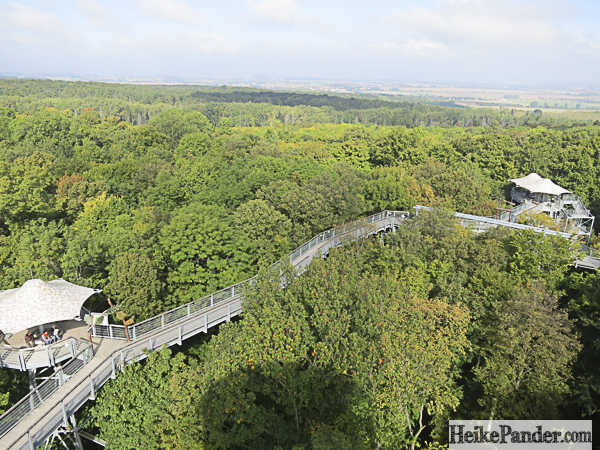 Most run past the treetops at heights between 20 and 30 meters. 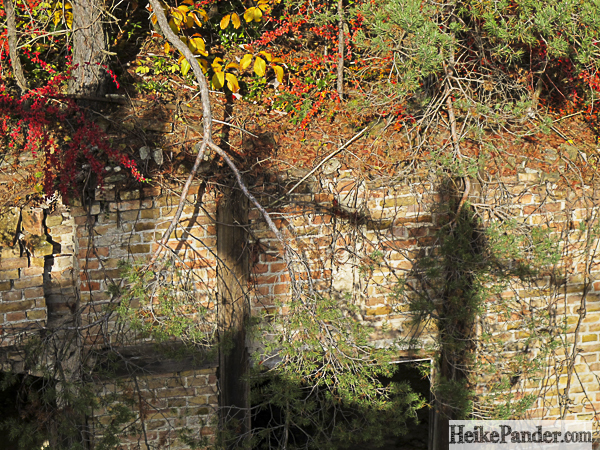 The highlight of the trails usually is an observation tower. It allows incredible views to the horizon and naturally into the treetops around. 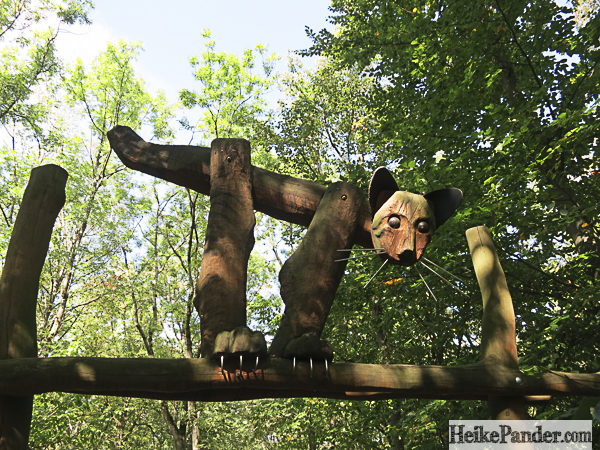 Each season at the treetop paths is appealing. I love being at eye level with the crowns and to experience what is happening high above the ground. 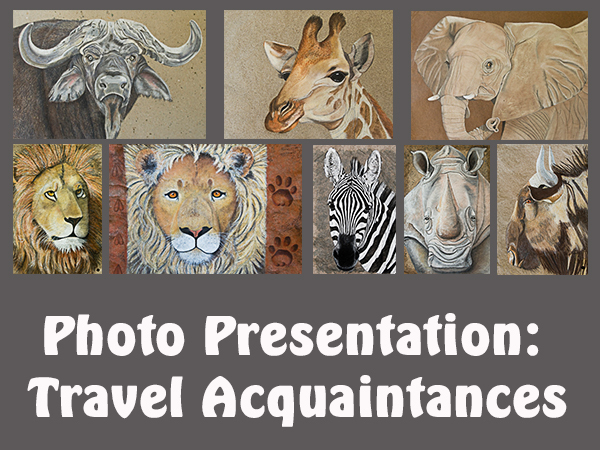 The trails that I have visited provide ample information about the characteristics of the trees and their inhabitants. The differences in the paths make all of them interesting and very special. This treetop trail was the first one I visited a few years ago. 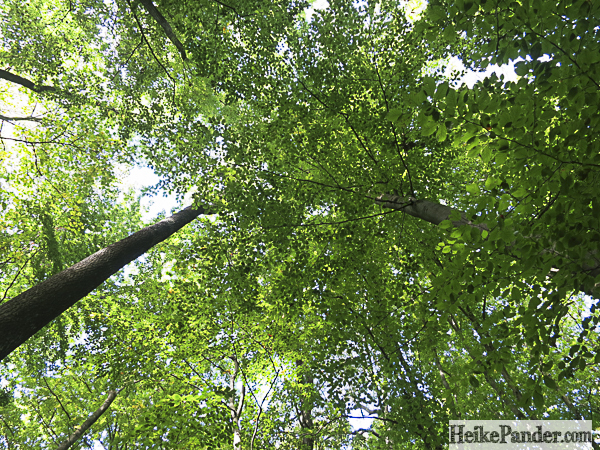 It is located in the core area of the national park Hainich at Thiemsburg, about ten kilometers from Bad Langensalza. 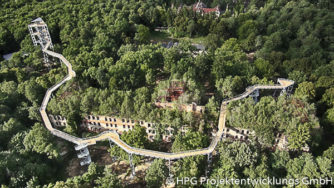 Two 530 meter long loops wind through primeval forest which is part of the World Heritage Site Hainich. The hanging bridges made of rope particularly appealed to my inner child and I had to climb them, of course. 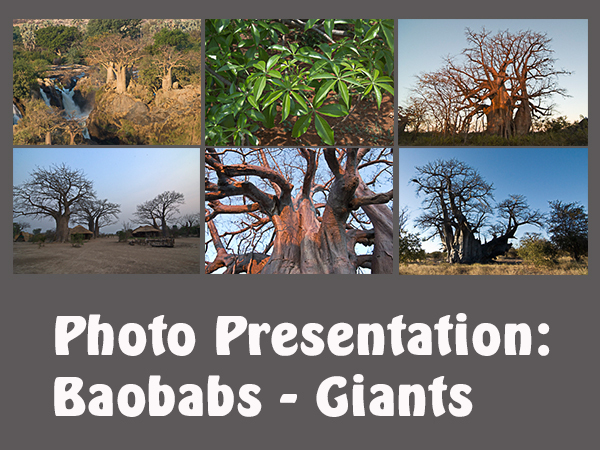 Information boards reveal details of different tree species and their inhabitants. The path has opened in 2009 in its current form. The National Park Center was of particular interest to me. Interactive information facilities allowed interesting experiences. I appreciated the examples of innovative technology shown which man has copied from nature. For example the ability of lotus flowers to repel water or the flippers of ducks. The region has invested a lot into marketing. One can go hiking in the Hainich and add a few days to experience the nearby cultural landscape or visit the Wartburg. 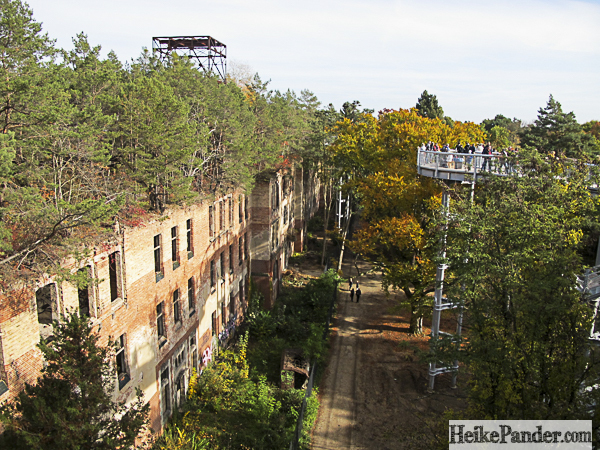 I was particularly impressed by the treetop trail at Beelitz. 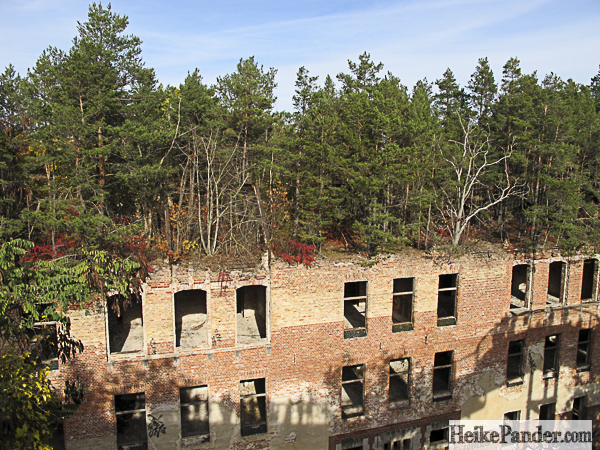 On top of the magnificent nature experience I got a journey into the past of Beelitz Heilstätten, left over ruins from a sanatorium. 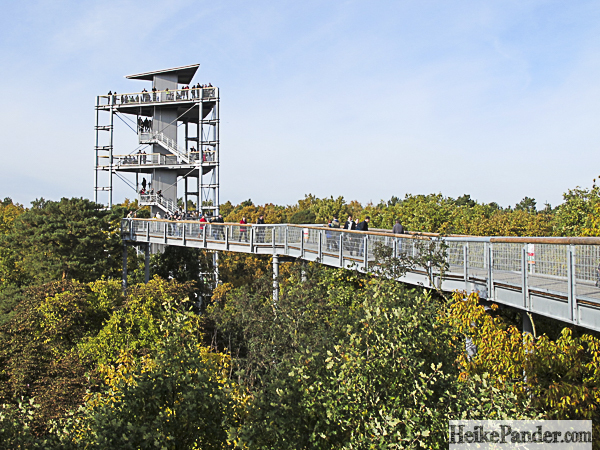 The path comes with a 40 meter high tower, which offers a great view into the ruins and on beautiful days even as far as Berlin. The actual path is about 320 meters long and hoovers right above some of the ruins. I find the combination particularly fascinating because it allowed me to witness a renaturation process of a special kind. 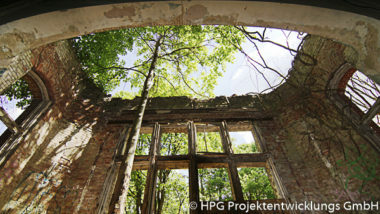 One of the buildings ruined during World War II hosts a thick layer of humus which has developed over 70 years. Nature conquered back some space. 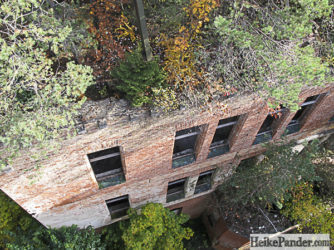 Today a lush forest lives on the old roof. 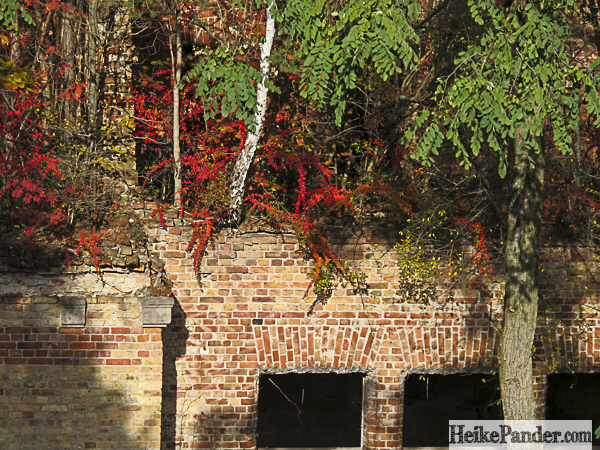 At the turn of the 20th century the building complex of Beelitz Heilstätten was used as a sanatorium built for the tuberculosis-stricken population of Berlin. The area covers about 200 hectares and includes 60 protected historic buildings. After the German unification the area remained economically unused. 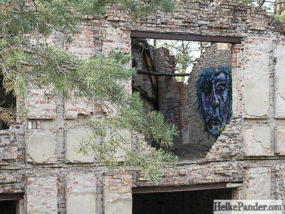 It mainly served as a playground for adventurers and party people. Natural decay and vandalism damaged the buildings even more. 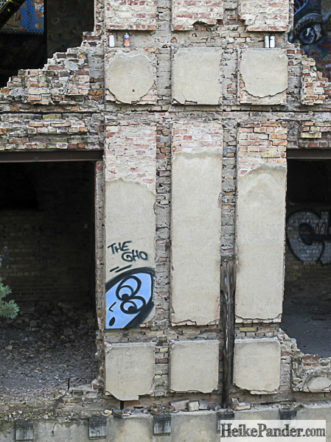 Nevertheless, the morbid charm of the area still lures photographers and filmmakers to these “Lost Places”. 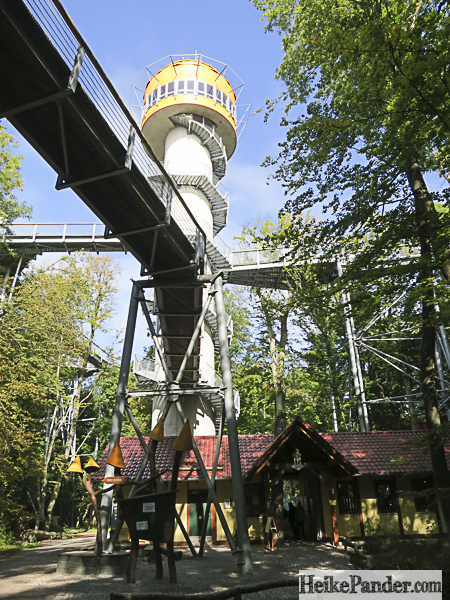 The treetop trail has opened its gates since September 2015. The private investor plans to turn the area into a recreational park with various attractions. 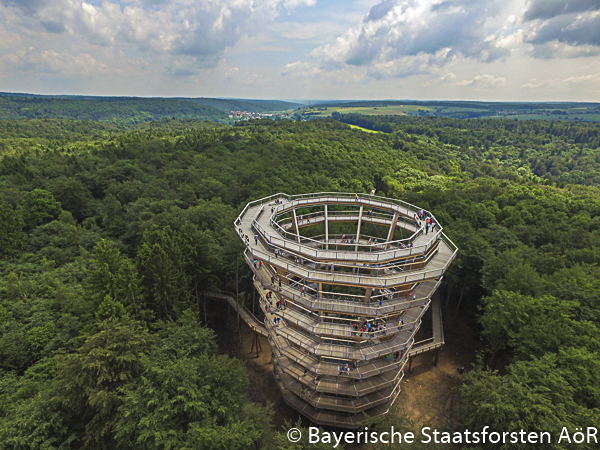 My youngest treetop trail experience took place in the beautiful Steigerwald near Bamberg in Bavaria. The path has opened for the public in March 2016. With its 1,150 meters it is the longest of the three trails I explored. 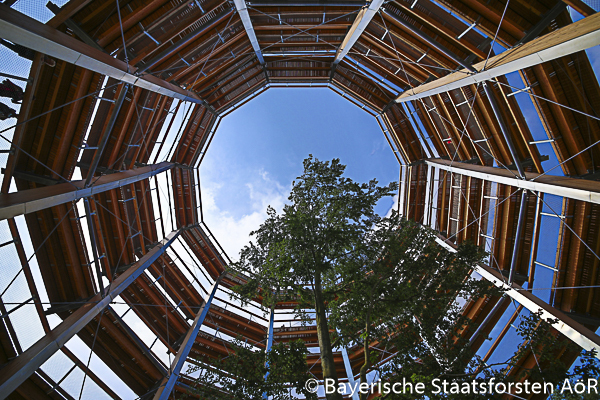 I was particularly impressed with the gigantic wooden structure of the tower. It rises like a funnel amidst the beech tree tops quite visible from afar. It is 42 meters high and covers nine floors. 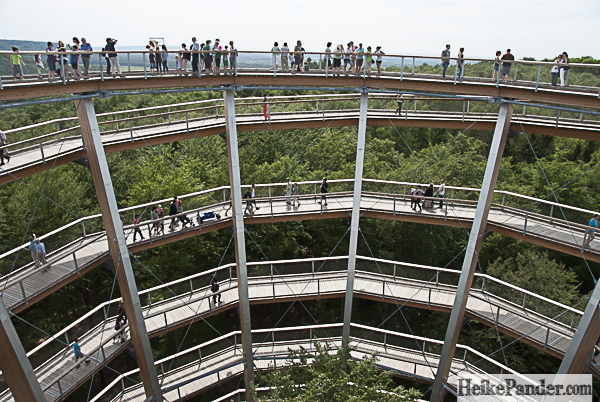 Visitors walk on the outside of the spiral and up on the 640 meter long ramp. With a gradient of six percent it allows people in wheelchairs or with prams to get to the top, too. I enjoyed to climb up floor by floor while I could explore the trees from different angels. The view of the cultural landscape of the Steigerwald is magnificent. Just as interesting is the view into the structure itself. 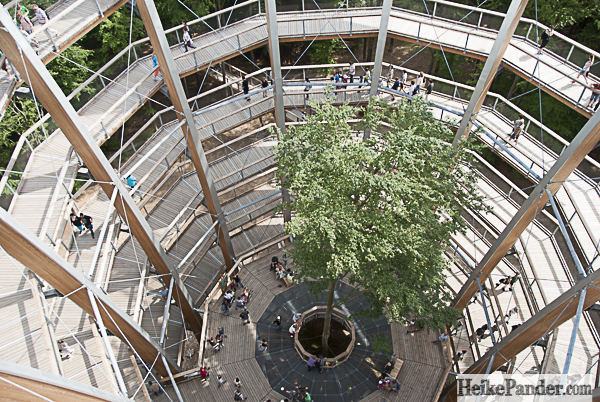 From high above, people on the ground seem small – as does the single tree that ekes its existence next to the recreation platform. The treetop path Steigerwald is located at the Methuselah Trail. 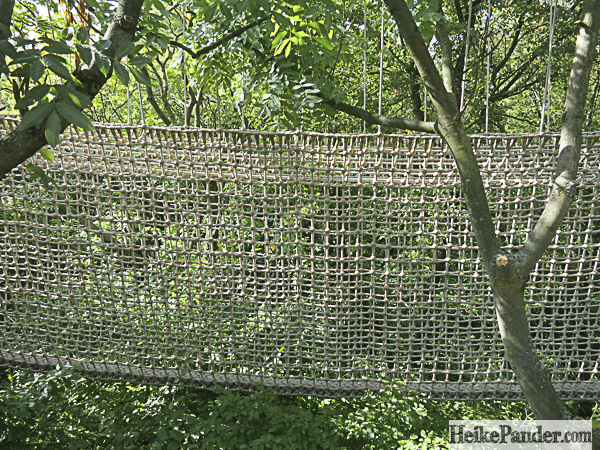 While hiking the trail on the ground the treetop path offers a great opportunity to take a break, explore the treetops from above and enjoy the excellent view. This entry was posted in Blog, Europe, Travel and tagged Baum & Zeit, Baumkronenpafd, Baumkronenpfad Beelitz, Baumkronenpfad Hainich, Baumwipfelpfad, Steigerwald by Heike Pander. Bookmark the permalink.